Pour dire, qu’entre notre humeur du moment (puisqu’il est dit que forcément nous en avons une), l’architecture et l’acoustique du lieu, le type d’attention du public et les caractéristiques du bruit de fond, le lieu et le moment passent au filtre de notre propention à jouer ou à ne pas jouer (ceci ou cela). Ce duo a commencé comme un projet d’improvisation purement musicale. 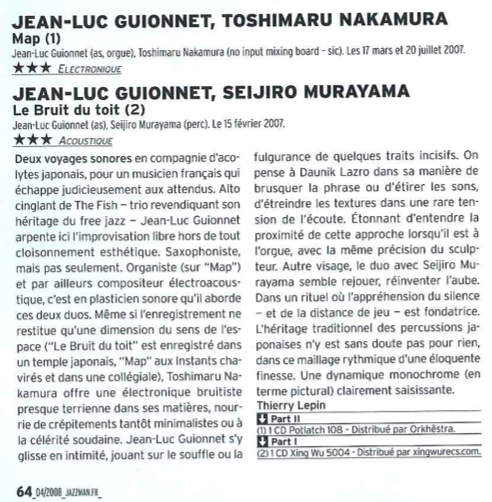 En 2006, il a été intégré par Catherine Diverrès dans un projet chorégraphique (Blowin’), tout en poursuivant en parallèlement son chemin original. Structure, présence des danseurs, lumière, objets, tous les éléments de cette création nous ont obligé à trouver des modes de jeu musicaux complètement différents, malgré l’engagement fort du projet dans l’improvisation qui nous est familière. The qualities and unique quantities of a site are the first condition of our music, the switch which obliges us to play this way rather than that. Inevitably, this implies great diversity between one concert and another. Via our moods at a particular moment, (since it is a given that we are prone to moods ! ), the architecture and acoustics of the site, the attention brought to bear on proceedings by the public and the characteristics of the background noise, the site and the moment pass through the filter of our propensity to play or not play this or that. 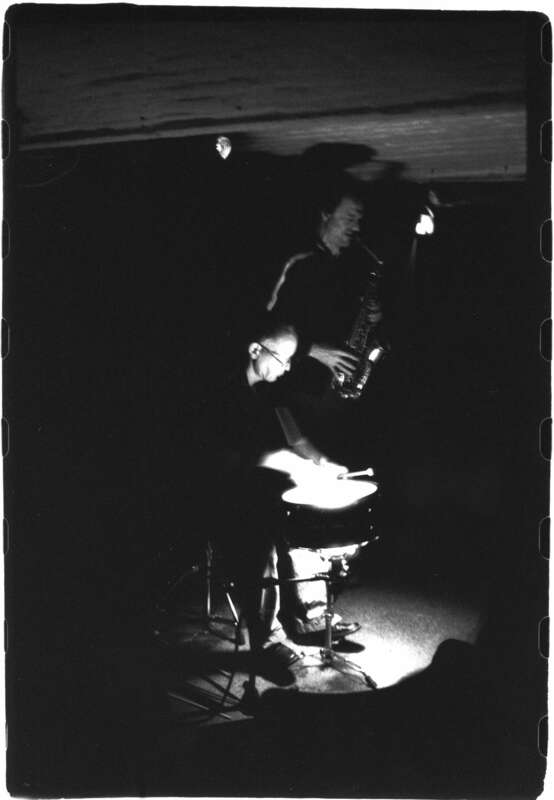 The duo started life as a purely musical improvisation project. It came about in 2006 as part of Catherine Diverrès’ choreography project, Blowin’, following at the same time its own original path. A structure, the presence of dancers, light, objects, all the elements of this creation, forced us to find completely different musical games, despite the project’s being located firmly in the improvised world familiar to both of us. 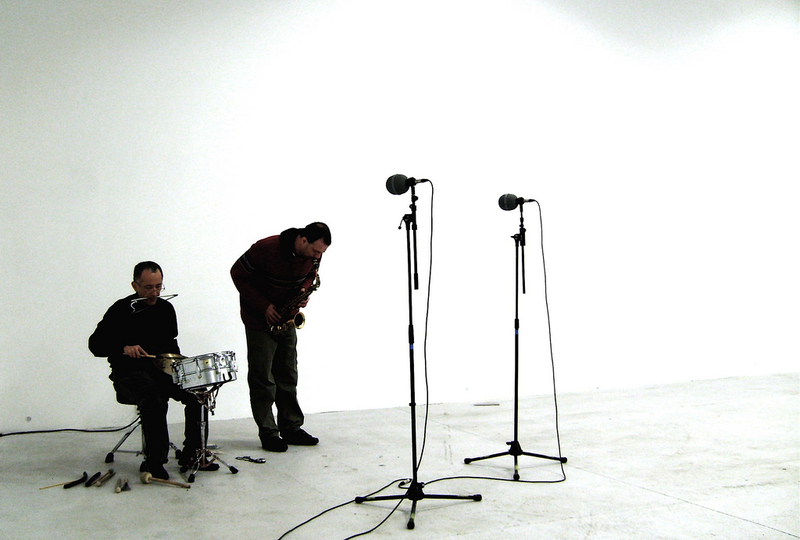 It was from this point that the idea of exploring different fields, in duo, sprang forth, pre-supposing a "non-concert" situation – in terms notably of a particular space-time and in terms of silence. To give a concert as if it were a non-concert. 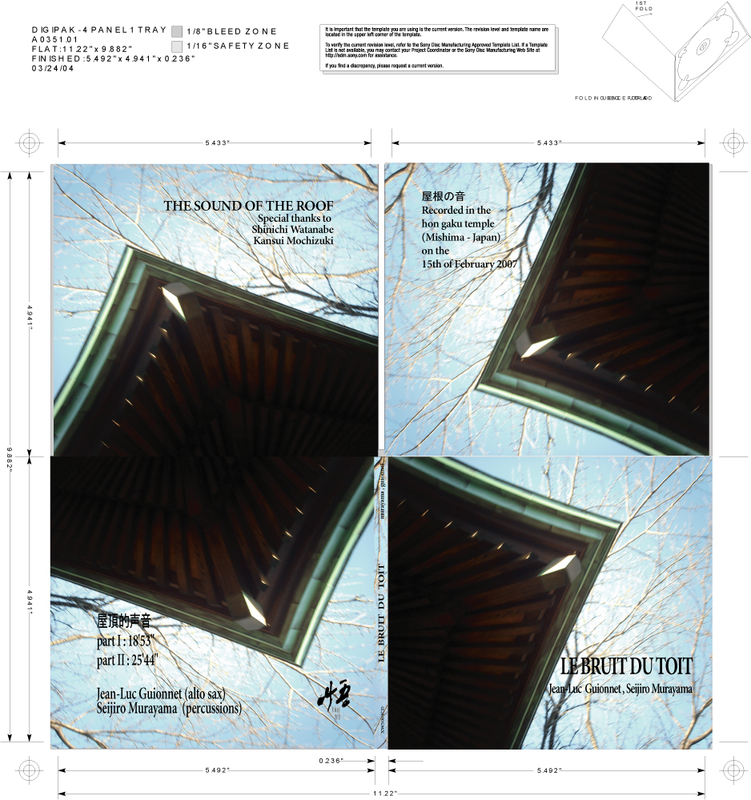 “LE BRUIT DU TOIT is a rare meeting, and a recording which took place at a Buddhist temple in Mishima, between two stalwarts of music — Seijiro Murayama, founding figure of numerous seminal avant-rock outfits during the 80s/90s like Fushitsusha (Murayama was its original drummer) and ANP (Absolut Null Punkt) ; and Jean-Luc Guionnet, already a veteran and a revered artist in the musical constellation of sound art/composition and improvised music. A rare meeting, not because this was their first and only time playing together, but rare in the sense that this meeting was a culmination of a series of unprecedented events (mostly seemingly banal and mundane) and musical possibilities that occurred before and during that meeting. This document could be viewed as a portrayal of the very first time they had expressed themselves in a manner previously never explored and rendered conceivable between the two. Sounds, approaches and possibilities never before coaxed from their instruments, not to mention constitutive of their overall artistry, have now and hitherto found life during this meeting and after. E un incanto di quelli fragili, ma proprio per questo preziosissimi, questo incontro tra il sassofono di Guionnet e le percussioni del giapponese Murayama : in un tempio buddhista di Mishima, i due esplorano lo spazio sonoro come cosmonauti che fluttuano attorno a una stella.Piccole increspature, sgocciolii, stridori lontani, si succedono senza fretta, disegnano i contorni dell’ambiente con meticolosità, si appoggiano al tetto del tempio per scivolarne giu lungo il perimetro. I due musicisti cercano se stessi ognuno dentro l’altro e non si prenda questa come una scontata metafora : ascoltando le due lunghe improvvisazioni - specialemente se si ha il tempo di farlo senza venire disturbati - si riesce a percepire l’energia che viene scambiata con l’ambiente circostante. Santiago Compostella, Espagne. Ciclo espazos sonoros 2009.
other act :Red De Planeet and dj.s Obscuriosa.